Having a hell of a good time! It’s time to get out your beam katana and slash your way through hordes of bugged-out enemies in Video game land. The Otaku Assassin has returned on perhaps his weirdest adventure yet. Yep, you guessed it! 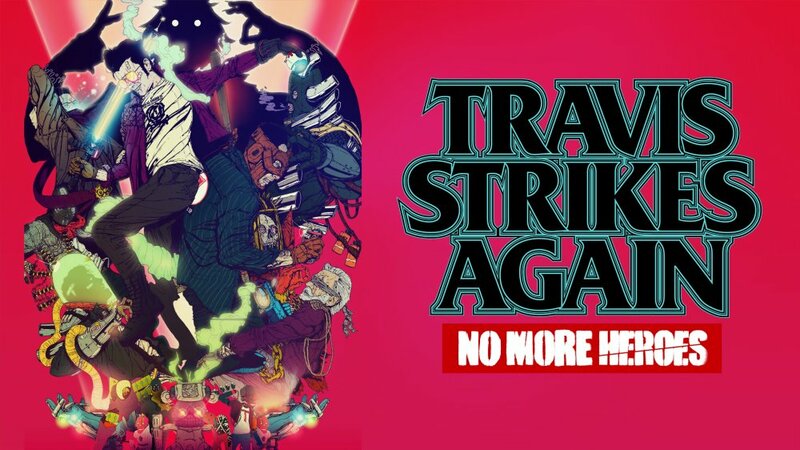 It is time for our Travis Strikes Again: No More Heroes review. Travis Strikes Again: No More Heroes is developed by the legend that is Goichi Suda, aka SUDA51 and his team at Grasshopper Manufacture using Unreal Engine. The game was first announced back in 2017 during Nintendo’s January Presentation for the Nintendo Switch. It is a spin-off from Suda’s No More Heroes series and features the main protagonist Travis Touchdown who is in hiding after the events of No More Heroes 2: Desperate Struggle. Two years since the announcement, we can now finally join Travis on his newest adventure as he gets sucked into the world of video games, literally. Somewhere in the deep South West, Travis Touchdown has been hiding out in a Trailer. One night, a stranger pulls up in his car just outside the trailer. A man steps out, wielding a baseball bat and has the look of a man with an axe to grind with Travis. The man walks into the trailer to ambush Travis but Travis was already aware of the man’s presence. After all, you are bound to hear a car pull up outside your trailer in the dead of night. The two men tussle and it is in this moment that the stranger reveals himself to be Badman. Badman being Bad Girl’s daddy and is after revenge for the death of his daughter who was killed by, you name it, Travis Touchdown. During the fight, Badman notices the nefarious Video game console, the Death Drive Mk II. Both men get sucked into the video game console and end up in the video game world of Electric Thunder Tiger II. It is said that the mysterious machine has the power to grant the wish of whoever collects and completes all of the game cartridges known as Death Balls. Travis and Badman work together to collect the Death Balls and finish them all in the hopes to bring back Bad Girl from death. This is normally the part where I would talk about the game’s graphics. So I will try my best with Travis Strikes Again: No More Heroes as it doesn’t just have one representation. Travis Strikes Again is as top-down/isometric/2.5D side-scrolling action adventure game. Depending on the “Game” Travis has entered, it could feature vector graphics or 3D polygons. Plenty of attention has gone into detail but due to the camera angle and lack of zoom, most of the time you can’t really appreciate it. The music has a real retro feel to it. It is a blend of punk, electro pop and some 8-bit chip tunes as well because, why not? The funky and energetic tones are reminiscent of video games of the ‘80s and early ‘90s. Even when booting up the Death Drive Mk II and listening to the “Death Drive” Intro which sounds awfully similar to the SEGA intro of Times past. As regards to gameplay, Travis Strikes Again: No More Heroes, is a hack and slash game with platforming elements as well. There are some RPG elements like earning experience, leveling up and special skills you can acquire in the form of data chips. As you venture through each game, you will be become trapped during certain segments and ambushed by enemies known as bugs. These bugs come in many humanoid shapes and sizes and each have their own form of attacks. Some are straightforward melee fighters, others can fire projectiles. There are some that are shielded and others that are heavily armed and take some time taking down. After you kill off the bugs, you will be able to progress until the next ambush and so on. In most of the games, there is a mid-boss that you usually fight one-on-one with but there are occasions where he comes with his friends. With a choice of a quick attack, strong attack and up to four skills at your disposal. You can lay waste to your enemies with a myriad of attacks. You have a special meter as well that can do a special attack and if you can keep chaining attacks without getting hit too much. If you reach the level 3 version of the special attack, you can really do damage and can use it again if you build up the meter without getting hit. There are 7 Death Balls to collect and play. The first game, Electro Thunder Dragon II, you already start off with and you can’t go back to the real world until you complete it. Once you do, you will be taken back to the trailer where you can use coins that you found in the games to buy new t-shirts. The t-shirts don’t add any special abilities or anything but they do allow you to represent your favourite indie games character. This is a very nice touch but due to the camera angles when playing and lack of zoom, you can’t admire the t-shirts as much as you would like to. Still, most cut-scenes in the game will have your chosen t-shirt displayed and a quick trip to the porta potty will net you a better close up look as the game saves. Oh yeah, I forgot to say. Dropping a load is how you save the game but if you played any of the No More Heroes games, you probably already know that. Though the majority of the Death Drive MK II games are hack and slash, there are some that break up the theme with a genre of their own. Golden Dragon GP is a drag racing game which is broken up with hack and slash side missions as you hunt for parts to upgrade your vehicle. Life Is Destroy is a murder mystery game with puzzle elements that has player rotate certain parts of the suburban map to make a path to the murder houses. Coffee and Doughnuts is a 2.5D side-scrolling platformer game where you have to find coffee and doughnuts for a dying hero. At the beginning of each game, you can choose to play as Travis or Badman. You can play most of the games with a friend as well by choosing the Co-op option in the pause menu. You can’t both be the same character though, so one will play as Travis and the other as Badman. You can also change your character at any time in the pause menu as well. Each character also has special Skills Chips that only they can use. There are even two that can be used together for maximum effort in taking down bad guys. Who said playing together isn’t fun? If you do get bored with playing together though, the second player can drop out and drop back in at any time. Back at the trailer which acts as the main hub, you can save your game or change T-shirts that you have acquired in the bathroom. The PC allows you to buy t-shirts to customize Travis or Badman and you can gain access to the Ramen Blog. Ramen being noodles in a meat or fish broth which in this game, helps power up your characters and return them to full health. The fax machine gives you access to messages from a mysterious person known as K and your talking cat Jeane. K sends faxes every time you finish a death ball and reveals the game’s plot and the reason for the Death Drive Mk II’s existence. Jeane, on the other hand, sends you fax messages when she gets stuck in one of the game worlds in which, you have to go rescue her. The archives provide some basic information to each of the Death Drive’s games. It is displayed like the pages of a video game magazine and can provide some helpful tips on each game. The Death Drive Mk II is where you can access the Death Balls that you have collected and play their games. The last option that you can access is just outside of the trailer in the form of Travis’ motorcycle. This allows players to access Travis Strikes Back, a retro visual adventure novel with scrolling text that aims to expand on the game’s plot. Travis and Jeane travel across the globe meeting and fighting mysterious characters in order to find the Death Balls. The Travis Strikes Back mode doesn’t feature any playable moments but it is essential in finding the Death Balls and progressing the story. You can’t get other games to play until you complete each Travis Strikes Back sequence. You also can’t access the next sequence in Travis Strikes Back until you have beaten the last Death Ball you have collected. The two game modes are entwined to each other and set requirements must be met in one mode before progress can be made in the other. When playing Travis Strikes Again for the first time, you will be asked which difficulty mode you would like to play. The three options available are Sweet (Easy), Mild (Normal) and Bitter (Hard). Upon completion of the main game, you will unlock the extra hard “Spicy” mode. You will also be able to change the difficulty at any time in the options menu. Thanks to a new update, Players that beat the game can play New Game+ which, allows player level, stats and skills to carry over to the new game and play through the whole story again. So, probably the most important to talk about now is controls. You can play in handheld, Docked or TV mode. Pro controller is supported but you can just as easily play with a single Joy-Con. The left joystick is used to move around but pushing the left joystick in and shaking the Joy-Con or wagging the right Joystick will power up your weapon. The Y button is a quick but weak attack and can be held down to continue attacking. The X button is your strong attack. Holding it down will power up a stronger spin attack but you won’t be able to move when charging up the attack. Once enough special power is charged, you can unleash an extra powerful special move with R. Doing so will allow you to increase the special power level to the next stage for an even stronger special attack. When you have allotted your Skills Chips, you can use them by holding down the L button and pressing the corresponding button (A, B, X, Y or Up, Down, Left, Right). When in a pinch you can use the A button to dodge or the B button to jump. You can get overwhelmed by hordes of enemies fairly quickly so knowing when to jump or dodge can be lifesaving. Travis Strikes Again: No More Heroes is a game that is not afraid to overstep the mark. Its humour can be crass, swearing is common place and is quite violent. It is a champion amongst indie titles but it does have its flaws like trying to cover a lot of bases and not enough of each. I felt that the racing mini-game Golden Dragon GP could have been expanded on a little more but it isn’t enough to drag the game down. For a game that is built using the Unreal 4 Engine, I would have liked to have seen more hi-res graphics or at the very least, some more of those ultra cool and colourful cuts-scenes. The Travis Strikes Back mode would have benefitted more from using animated cut-scenes as opposed to the green and black “Metal Gear Solid” Codec style that we have. Don’t get me wrong, I appreciate the style and it is very reminiscent of the old video games that used text to narrate the game’s story, but it does tend to drag on a bit, especially when all you want to do is get back to the action. That said, the game developers are aware of this and make it clear at certain points that the story is dragging on and that players just want to get back to playing rather than reading. Dead Pool may have invented the fourth wall break but Travis has perfected it and takes it to new levels with language that would make even the Merc with a mouth blush. Travis Strikes Again: No More Heroes is a game you never knew you wanted until you play it. It doesn’t matter if you have never played the mainline series, the story arc of Travis Strikes Again is more like a 2.5 version rather than an actual sequel. The gameplay, though it is a hack and slash, it is not the same as in the No More Heroes series but it’s not dissimilar either. It has been streamlined to incorporate the control scheme of the Joy-Con and can be played easily on a single Joy-Con. It is a game that is not afraid to mock itself or others for that matter. The added collaboration of the Indie T-Shirts shows a deep love and connection to indie game developers. The music is funky yet motivating and knows how to tug on the Nostalgia vein. For $29.99, you do get your money’s worth and the season pass will bring more characters to play and new “games” to play. I may have been given a review code for this game and I didn’t know what to expect but I have strangely fallen in love with it. So much so, that I have pre-ordered the special edition that releases in February just because I enjoyed the game that much.